We popped into our local kitchen shop this morning to buy Ms. R a cat apron (or rather, an apron with cats on it, not an apron for cats), and ended up spending far too much on some really high-quality utensils. Second, and my personal favourite, is a Global Japanese-made stainless steel "oriental-style" pairing knife, and a diamond sharpener for our other knives. I love tools, and believe in buying good, high-quality and durable ones - made by the best manufacturers I can afford to buy. I see knives as being no different; they should be made to last a lifetime and with the right care they can. So I've been trying to find a good set of knives for years; and never found anything I actually wanted to invest in, until I spotted some ceramic knives a few months back. Having only just washed one of the ceramic blades, it chipped placing it wet on the draining rack - not something I would expect of a supposedly high-grade blades (turned out they where made in China, though branded by a high-end traditional manufacturer). I took them all back, and gave up looking, with the intent of investing serious money some other time into proper Japanese knives. I spotted some well priced ceramic blades this morning, and was weighing up buying one to try, as again, they where made by a high-end manufacturer, or whether to plump for steel. Checked the small print - low and behold made in China. Decision made for me. I narrowed my choice down to Rockingham layered blades and Global Japanese steel blades. While the Rockingham seem to have perhaps the best finish now, I was a little put off by the handle construction - the Global knives are all one-piece with sand-filled handles, so have really nice balance and weight. I've started with a pairing knife, as these I find tend to give you the biggest range for most preparation work - the oriental model feels much nicer than the normal vegetable models, plus I think it'll be a good knife for sashimi, so I've decided to start my new set with one of those (a GS-58 to be precise). I was eying up a couple of choppers, but since they start from £110, I think I'll be waiting a little for those. In the meanwhile, I'll keep our existing knives sharp with our new Global sharpener (tempted by the wet stones for a better finish in the future), and make do with my current chopper-come-mini-clever. 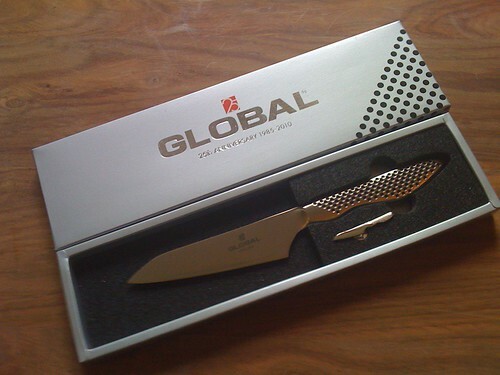 Though we'll probably have great local steak this evening, I can't wait to start cutting things with my new knife!